ARM Holdings are the makers of the most widely used computer architecture in the world. ARM processors power everything from digital signage to ATMs to cellphones, and their operations have been scaling up recently as they improve on the Cortex architecture. Ahead of Computex 2018, ARM has revealed the Cortex-A76, a new generation of ARM processors powerful enough to run desktop and laptop experiences, and these chips will be coming in the not-too-distant future. The Cortex-A76 architecture will come to power a range of devices from manufacturers like Acer, Dell, and HP, all of whom are in the business of designing, manufacturing, and selling a new class of computers based on the ARM architecture running Windows 10. Compared to the A75, the A76 is estimated to be 35% faster and 40% more power efficient, as well as carrying a range of improvements to make the big.LITTLE core configuration more efficient and responsive. ARM can achieve these enormous leaps in performance because they gradually scale up the architecture’s capabilities through more efficient production processes, or even through simple clock speed adjustments. ARM is a RISC architecture, and it doesn’t carry generations of instruction set bloat to allow it to do more things than it was originally designed to do. 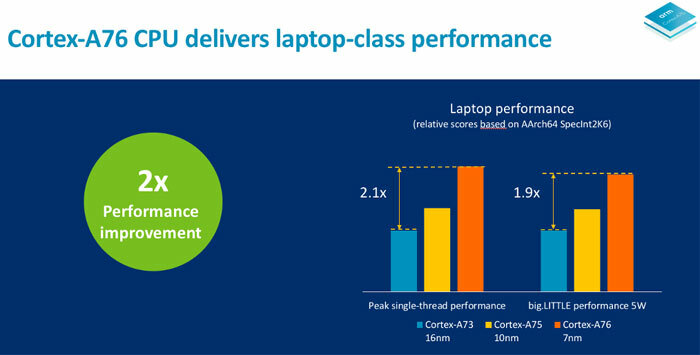 Aside from mobile phones, the biggest market for these chips would be laptops and hybrid tablets, and here ARM is boasting big improvements in performance compared to the previous two generations, up to a 2.1x improvement over the Cortex-A73. A73 is a 2016 processor family, and is found in products like the HiSilicon Kirin 960 (Huawei P10, Mate 9) and the MediaTek Helio X30 (Meizu Pro 7, 7 Plus). Technically it’s also part of the Snapdragon 830 chipset, but Samsung uses a modified Cortex-A73 as the architecture for the four faster cores. These improvements are big news because ARM-based laptops and tablets now run either Windows 10 in S Mode or Google ChromeOS, and browser-based interactions are the primary use for these devices. Having these speed-ups will help to make the browsing and productivity experience better on similar devices, and websites are definitely putting more and more strain on our computers as time goes by. 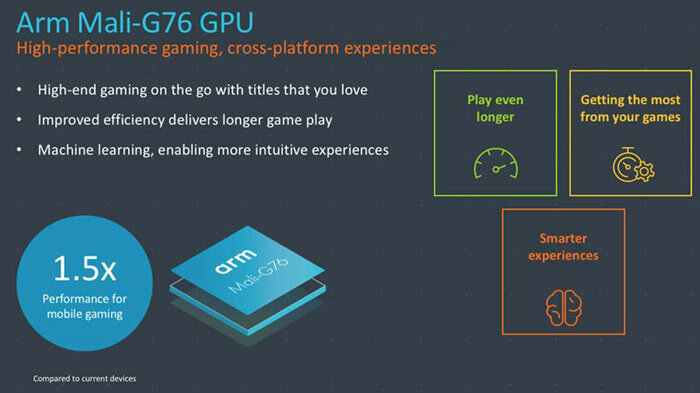 Graphics-wise, the Cortex-A76 cores are accompanied by the Mali-G76 GPU. This is a lightweight with effectively 20 GPU cores arranged similarly to AMD’s Graphics Core Next architecture. The Mali-G76 promises to be 25% faster than the outgoing Mali-G72, and has support for OpenGL, Vulkan, and Direct3D APIs. It additionally supports decoding of H.264, H.264 10-bit (HDR), VP8, HEVC Main, HEVC Main 10 (HDR), VP8 8-bit, and VP9 10-bit (HDR) video streams. The Mali-G76 can also be attached to a video processor called the Mali V76, which additionally includes the ability to handle video recording at up to 8K resolutions at 30 frames per second. 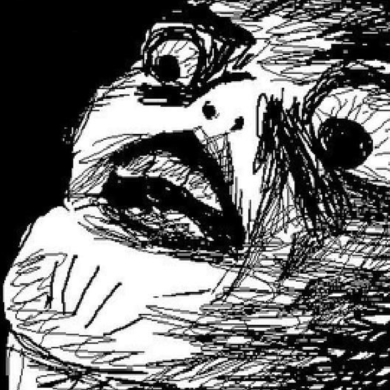 It can also decode 8K video at 60 frames per second. ARM clearly designed the Cortex-A76 architecture to be used for augmented reality, because it is also possible to attached the Mali-D71 which handles display scaling and processing, to provide low-latency solutions for augmented reality or virtual reality headsets. 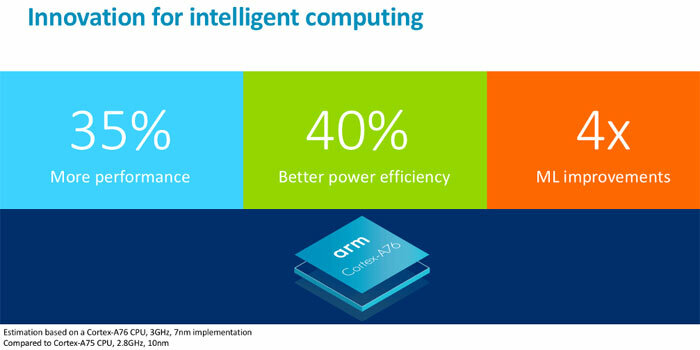 That’s a nice starting point for machine learning, ARM points out. You can expect to see the new ARM-A76 architecture and the Mali-G76 GPU shipping in new devices starting in late Q4 2018. Samsung has just announced their Snapdragon 850 chipset, which is rumoured to be based on the A76 architectire. Simulate the first ARM processor inside your browser today!